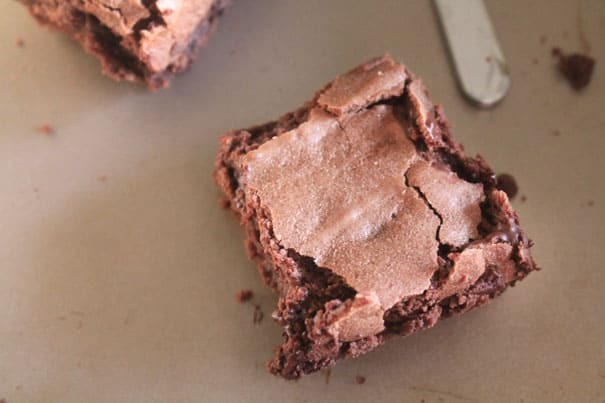 Did you know that today is National Brownie Day? What better way to celebrate such a delicious day than Mexican Chocolate Brownies? After several years of a lapsed subscription, my nephew’s school fundraiser has me receiving People Magazine on a weekly basis again. Believe it or not, I like getting People for the less celebrity-driven stories about real people, and also for the book, movie, and music reviews, more than anything. One new feature of the magazine (and I’m not sure when it started), is a few recipes in each magazine. They’re always seasonally appropriate, and come from all over. 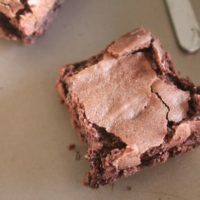 This Mexican Chocolate Brownies recipe caught my eye because it comes from Bird Bakery in San Antonio. I haven’t been there, but the brownies looked so good, I had to give it a try. A little side ingredient note – have you guys noticed that Ghirardelli is now selling their baking cocoa in resealable pouches instead of cylindrical cans? I am smitten. It’s so much easier to measure, scoop, and store! I really love the assertive spices here. The cinnamon is strongest, with just a background of heat from the cayenne. These are perfect with a cup of coffee on a freezing winter afternoon. You might notice that this is not my usual photo styling. I gave half the pan to my pal Mary Kay as thanks for babysitting one afternoon, and forgot to remind the husband to STOP EATING THE BROWNIES. These four are all that was left when I got to taking a photo a day later. They’re that good. 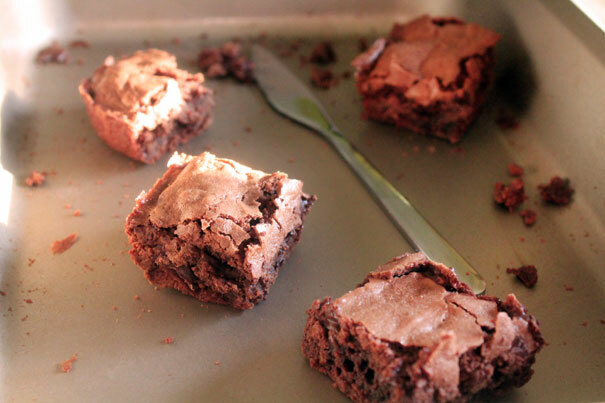 Looking for more ways to celebrate National Brownie Day? Don’t miss my Peppermint Bark Brownies and Nutella Cashew Brownies too! Preheat oven to 300°F. Spray a 13" x 9" baking pan with cooking spray. Melt butter in a measuring jug in the microwave. Stir, then add cocoa powder and mix until combined completely and a sort of sauce has formed. In a large bowl, mix sugar, cinnamon and cayenne pepper. Stir in the cocoa-butter mixture, stirring until very well combined. Add eggs, one at a time, stirring until the egg is completely incorporated. 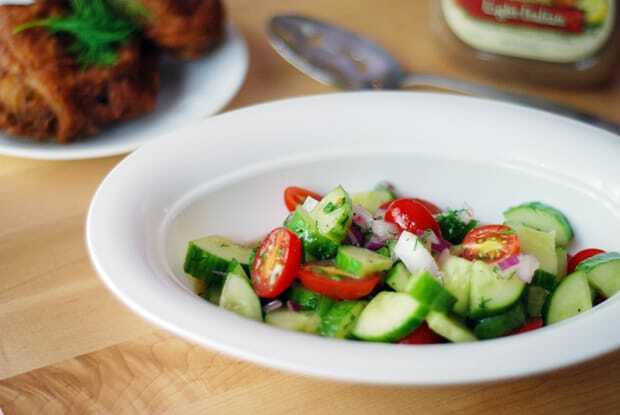 In a smaller bowl, combine flour and salt. Whisk to combine and aerate, then add to the chocolate mixture in three increments. Stir until just combined after each addition. Mix in chocolate chips, then pour into prepared pan. Bake for approximately 40 minutes, until only a few moist crumbs stick to a toothpick inserted in the center of the pan. Disclosure: This post is not sponsored or endorsed by Ghirardelli. I went to a promotional event earlier this year where they showed off their new baking products, including this baking cocoa. However, I have long used their products in all my baking, and will continue to do so whether they notice this post or not. I adore their chocolate! Thanks! I used the Dutch processed and they turned out DELICIOUS! It had the perfect spice with just a little heat. Laura, I’d use the dutch processed. I believe all the Ghirardelli cocoa powder is dutch processed. I don’t have ghiradeli cocoa powder but two different brands; one is Dutch processed and the other isn’t. Which should I use? I know sometimes recipes specify which kind because it can affect the overall end result. As, indeed, are these brownies. I can’t get enough of that combination of chocolate + spice. Seriously, who decided that cocoa needed to be in cans with a lip that make it impossible to get the last of the cocoa out without making a gigantic mess? I was pretty happy to see the pouches too!